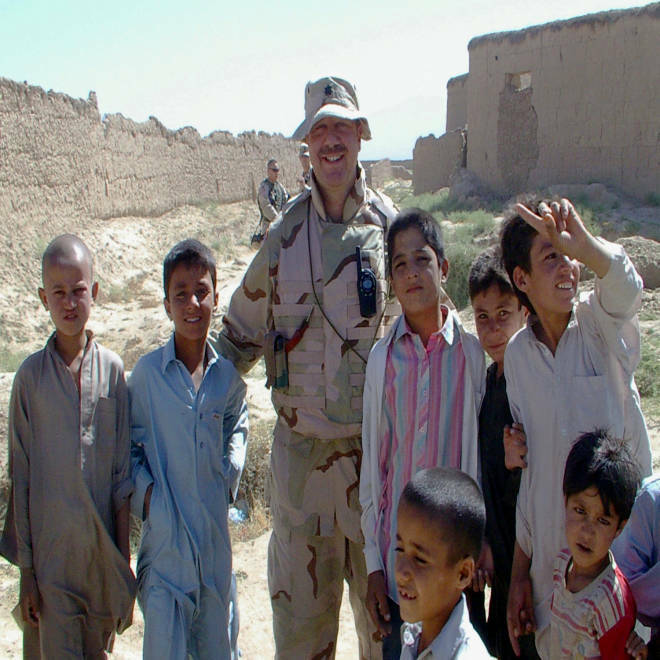 Army Reserve Aviation Specialist, Lt. Col. Chuck Schlom, pictured here on a Provincial Reconstruction Team mission in Afghanistan, was deployed in 2005. When his employer found out, he was fired. Despite laws protecting the civilian jobs of National Guard members and reservists, more than 15,000 troops since 2001 have had to fight for their employment rights through official complaints, resulting in tedious and sometimes expensive disputes, a News21 investigation shows. In the meantime, these service members remain unemployed or search for other work without any guarantee they will recover their jobs, back pay or pensions. Lt. Col. Chuck Schlom trained for more than 20 years before deploying to a combat zone. A former active-duty Army officer serving as an aviation specialist in the Army Reserve, Schlom said he was primed – at last – to go to war. “I was watching these kids fighting a war that I had been trained to do all my life,” he said. Two months after Schlom, a Chicago-based sales manager for SPX Cooling Technologies, notified the company he had been called to go to Afghanistan, a human resources manager summoned him to a breakfast meeting in the Hilton at Chicago O’Hare International Airport and fired him. A 1994 law called the Uniformed Services Employment and Reemployment Rights Act, or USERRA, says National Guard members and reservists can’t be fired or lose benefits or seniority because of military-related duties, including drill weekends or deployments like Schlom’s. “Here I am ready to deploy to a combat zone, and my company cans me,” Schlom said. Air Force Reserve Tech. Sgt. Jerry DeLay flew supplies into and out of Iraq and Afghanistan during his deployment from 2003 to 2005. DeLay, 46, returned to his job as a technician for ACE Heating in the Seattle suburb of Federal Way, Wash., to find his hours had been cut and given to another employee, he said. DeLay’s boss dismissed the service technician’s appeal and later fired him. DeLay filed a complaint with the government, though he’s among the minority who do. The federal government provides veterans a means to resolve USERRA complaints, first through the Department of Defense’s Employer Support of the Guard and Reserve, whose volunteers call employers, explain the law and try to resolve the matter. About 80 percent of cases are resolved within a month and usually involve employers who unknowingly broke the law and willingly correct the problem. If DOD workers can’t resolve the problem, service members can take their case to the Department of Labor – Veterans’ Employment and Training Service, known as DOL-VETS. The average investigation takes between 56 and 60 calendar days, and by statute, it must be completed within 90 days. The agency can send unresolved cases to the Department of Justice for legal action. Fewer than 10 percent of the cases are referred for possible court action, Labor data shows, though service members can independently request that their case be sent to the Justice Department or can hire a private lawyer. Schlom went first to DOL-VETS, but found the system frustrating and ineffective. After five months, an investigator told Schlom his case lacked merit. In the last seven years, Labor closed almost 30 percent of cases with a no-merit finding. USERRA lawyers and service members’ advocates say the agency finds too many cases without merit that are resolved by private lawyers weeks, months or years later. Last year, the Labor Department had 125 investigators working in the USERRA program, including seven senior investigators devoted solely to such cases, according to a spokesman. They handled more than 1,400 new cases in 2012, according to preliminary data. Six weeks after DeLay filed his claim, he also received a letter from DOL-VETS telling him his complaint had no merit. DeLay hired a private lawyer who subsequently uncovered fabricated and faulty documents the employer had supplied to the agency, including a Feb. 29 letter alleging misconduct. There was no Feb. 29 that year. Marine Col. George Aucoin, an attorney specializing in USERRA law, uses his leave time from active duty to work on USERRA cases. Sam Wright, often called the “Godfather of USERRA,” helped write the law. He said USERRA investigators tend to take the “path of least resistance,” too often accepting what the employers say and closing a case as being without merit even if the service member was wronged. Chick Ciccolella, who oversaw DOL-VETS as assistant secretary of labor from 2005 to 2009, said investigators often gave employers too much time to respond to an inquiry. DeLay ultimately won a $542,000 judgment in 2007, after spending more than 14 months in court. His employer filed for bankruptcy and he hasn’t seen much of the money. On the day he lost his job, he started his own heating business. Linda Hayes, a spokeswoman for Hayes Heating, formerly ACE Heating, which was cited in the USERRA lawsuit, said the company did not break the law and maintains she and her husband support the military and USERRA. Schlom eventually settled with SPX Cooling, more than two years after his firing. SPX Cooling did not respond to repeated requests for comment. While still in the Reserve, Schlom said he became his unit’s de facto USERRA expert. Riley Johnson was a Peter Kiewit Foundation Fellow, and Rachel Leingang was an Ethics and Excellence in Journalism Foundation Fellow for News21 this summer.